Edward H. Pickard (left) was born on January 27, 1854, in Boston, Massachusetts; He was a Private with Company F who was with the pack train and in the hilltop fight during the Battle of the Little Bighorn. He died on January 30, 1928, in Portland, Oregon, and was buried in Lincoln Memorial Park there. Jacob Katzenmaier was a Private in Company G who was not present during the battle due to detached service. He died in Fort Meade, Dakota Territory, on January 27, 1880, and was buried in the Old Post Cemetery there. Wilson McConnell was born on January 28, 1839, in New Castle, Pennsylvania. He was a Private in Company K who participated in the hilltop fight. William Thomas Craycroft (left) was born in Springfield, Kentucky, on January 28, 1847. He was a First Lieutenant in Company B, but he was on detached service during the battle. John Curtis Hall was born on January 29, 1852, in Lycoming County, Pennsylvania. He was a Private in Company D who participated in the hilltop fight. Uriah S. Lewis died on January 29, 1914, in Philadelphia, Pennsylvania, and was buried in St. Peter’s Cemetery in North Wales, Montgomery County, Pennsylvania. He was a Private in Company D who was not present at the battle due to detached service. Michael Martin died at Bear Paw Mountain, Montana, on January 30, 1877, due to a shot in his chest and was buried in the Custer National Cemetery on Crow Agency, Montana. Frederic Francis Girard (left), an interpreter for the cavalry, died on January 30, 1913, in St. Cloud, Minnesota. He was buried in the Saint Benedict’s Parish Cemetery in Avon, Minnesota. John Charles Creighton, a Private in Company K who participated in the hilltop fight, died in Tacoma, Washington, on January 30, 1935, and was buried in the Tacoma Mausoleum. Garrett H. Van Allen was born on February 1, 1846, in Bethlehem, New York. He was a Private with Company C who was killed with Custer’s column and was buried on Last Stand Hill. George Lawrence Heid died at Fort Totten, Dakota Territory, on February 1, 1887. He was a Private in Company M who was in both the valley and hilltop fights. He was buried in the Custer National Cemetery. James Ezekiel Porter (left) was born on February 2, 1847, in Strong, Maine. He was a First Lieutenant in Company I who was presumed killed and may have been buried on Last Stand Hill. Johann Michael Vetter was born in Hessen, Germany, on December 23, 1853. He was a Private in Company L who was killed during the Battle of the Little Bighorn. John Martin (left), who immigrated from Italy as Giovanni Martini, died on December 24, 1922, in Brooklyn, New York, and was buried in Cypress Hills National Cemetery there. He was the Trumpeter for Company H who brought the famous “be quick” note to Benteen. Martin Personeus died in Carlinsville, Illinois, on December 24, 1889. He was a Private in Company L who was on detached service during the battle. John James Carey died in Malone, Grays Harbor County, Washington, on December 24, 1929, and was buried in Pioneer Cemetery in Centralia, Lewis County, Washington. He was a Private in Company B who was with the pack train and in the hilltop fight. Thomas W. Coleman was born on December 25, 1849, in Troy, New York. He was a Private in Company B who with the pack train and in the hilltop fight. Edwin B. Wight was born in Casco, Maine, on December 25, 1851. He was a Private in Company B who was on detached service during the battle. William Millard Caldwell married Blanche Miller on December 25, 1887, in Clearfield, Pennsylvania. He was a Private in Company B who was on detached service during the battle. John Sivertsen (left) married Anna Olson on December 25, 1889, in Douglas County, Wisconsin. Thomas Wilford Harrison (right) died on December 25, 1917, in Philadelphia, Pennsylvania, and was buried in the Holy Cross Cemetery in Yeadon, Pennsylvania. He was a Sergeant for Company D who was in the hilltop fight. Stephen Cowley was born on December 26, 1846, in Sligo, Ireland. He was a Private in Company D who was not present at the battle due to detached service at Yellowstone Depot. MaxHoehn (left) was born in Berlin, Germany, on December 26, 1854. He was a Private inCompany L who stayed with the regimental papers at Powder River so he was not in the battle. Timothy Haley was born on December 26, 1846, in Cork, Ireland. He was a Private in Company H who participated in the hilltop fight. John Meyers died of consumption on December 26, 1877, at Fort Abraham Lincoln in the Dakota Territory and was buried in the Custer National Cemetery in Montana. He was the Saddler for Company C, and he participated in the hilltop fight. John J. Fay died in Washington, D.C., on December 26, 1932, and was buried in the Soldiers’ Home National Cemetery there. He was a Private in Company D who participated in the valley and hilltop fights. John Fox also died in Washington, D.C., on December 26, 1932, and was also buried in the Soldiers’ Home National Cemetery there. Like Fay, he was a Private in Company D and participated in the hilltop fight. Wilson McConnell died on December 27, 1906, in King, Wisconsin, and was buried in the Wisconsin Veterans Memorial Cemetery there. He was a Private in Company K who participated in the hilltop fight. Peter Thompson (left) was born in Markinch, County Fife, Scotland, on December 28, 1843. He was Private in Company C who was wounded in the hilltop fight. He was awarded the Medal of Honor for his actions during the battle. John Samuel Ragsdale married Lois Durham on December 28, 1877. He was a Private in Company A who was not present at the battle due to detached service. David McWilliams died at Fort Meade, South Dakota, on December 28, 1881, and was buried in the National Cemetery there. Hewas a Private in Company H who was not in the battle because he had been shot in the leg on the Far West on June 6, 1876. The Battle of Wounded Knee occurred in South Dakota on December 29, 1890. Richard Winick Corwine died during the Battle of Wounded Knee on December 29, 1890, and was buried at the Fort Riley Post Cemetery. He was a Private in Company A on detached service during the Battle of the Little Bighorn. Gustave Korn (left) was a Private in Company I and participated in the hilltop fight. He became the caretaker of Comanche, the only horse that survived the Battle of the Little Bighorn. Korn was killed during the Battle of Wounded Knee on December 29, 1890. 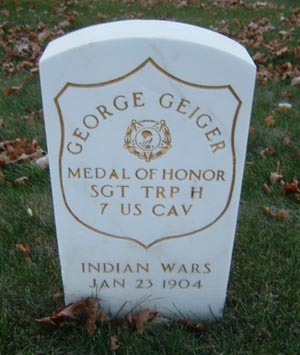 He was originally buried in the Pine Ridge Cemetery on Pine Ridge Agency, South Dakota, and was later reinterred at the Fort Riley Post Cemetery in Geary County, Kansas. George Daniel Wallace (right) was a Second Lieutenant who commanded Company G during the Battle of the Little Bighorn and fought in the valley and hilltop fights. He died on December 29, 1890, during the Battle of Wounded Knee due to gunshot wounds in his head and abdomen. He was buried on January 6, 1891, in the Rose Hill Cemetery in York County, South Carolina. Frank Hunter died on December 29, 1899, in Washington, D.C., and was buried in the Soldiers’ Home National Cemetery there. He was a Private in Company F who was with the pack train and in the hilltop fight during the Battle of the Little Bighorn. William Thomas Craycroft was born in Springfield, Kentucky, on January 28, 1847. He was a First Lieutenant in Company B, but he was on detached service during the battle. Uriah S. Lewis died on January 29, 1914 in Philadelphia, Pennsylvania, and was buried in St. Peter’s Cemetery in North Wales, Montgomery County, Pennsylvania. He was a Private in Company D who was not present at the battle due to detached service. John C. Creighton, a Private in Company K who participated in the hilltop fight, died in Tacoma, Washington, on January 30, 1935, and was buried in the Tacoma Mausoleum. George Heid died at Fort Totten, Dakota Territory, on February 1, 1887. He was a Private in Company M who was in both the valley and hilltop fights. He was buried in Custer National Cemetery. Dr. Henry Rinaldo Porter was born in New York Mills, New York, on February 3, 1848. He was the Acting Assistant Surgeon during the battle and saw action in the valley and hilltop fights. Martin Personeus died in Carlinsville, Illinois, on December 24, 1889. He was a Private in Company L who was on detached service during the Battle of the Little Bighorn. Giovanni Martini (left) died on December 24, 1922, in Brooklyn, New York, and was buried in Cypress Hills National Cemetery there. He was the Trumpeter for Company H who brought the famous “be quick” note to Benteen. Thomas W. Coleman was born on December 25, 1849, in Troy, New York. He was a Private in Company B who was with the pack train and in the hilltop fight. Max Hoehn was born in Berlin, Germany, on December 26, 1854. He was a Private in Company L who stayed with the regimental papers at Powder River so he was not in the battle. Stephen Cowley (left) was born on December 26, 1846, in Sligo, Ireland. He was a Private in Company D who was not present at the battle due to detached service at Yellowstone Depot. Timothy Haley was born on December 26, 1846, in Cork, Ireland. He was a Private in Company H who participated in the hilltop fight. He died on December 31, 1913, in Washington, D.C., and was buried at the Soldiers’ Home National Cemetery there. John Meyers died on December 26, 1877, at Fort Abraham Lincoln in the Dakota Territory and was buried in the Custer National Cemetery in Montana. He was the Saddler for Company C, and he participated in the hilltop fight. John J. Fay and John Fox both died in Washington, D.C., on December 26, 1932, and both were buried in the Soldiers’ Home National Cemetery there. Both were Privates in Company D. Fay participated in the valley and hilltop fights, and Fox was in the hilltop fight. Peter Thompson was born in Markinch, County Fife, Scotland, on December 28, 1843. He died in Hot Springs, South Dakota, on December 3, 1928, and was buried in the Masonic Section of the West Cemetery in Lead, South Dakota. He was Private in Company C who was wounded in the hilltop fight. He was awarded the Medal of Honor for his actions during the battle. David McWilliams committed suicide at Fort Meade, South Dakota, on December 28, 1881, and was buried in the National Cemetery there. He was a Private in Company H who was not in the battle because he had been shot in the leg on the Far West on June 6, 1876. Richard Winick Corwine who was a Private in Company A on detached service during the Battle of the Little Bighorn. Gustave Korn who was a Private in Company I and participated in the hilltop fight. George Daniel Wallace who was a Second Lieutenant in command of Company G during the Battle of the Little Bighorn and fought in the valley and hilltop fights. Frank Hunter died on December 29, 1899, in Washington, D.C. , and was buried in the Soldiers’ Home National Cemetery there. He was a Private in Company F who was with the pack train and in the hilltop fight during the Battle of the Little Bighorn. William Jackson (left) died at Cutbank Creek on the Blackfeet Reservation in Montana on December 30, 1899. He was a scout who participated in the valley fight. David W. Lewis died on December 30, 1914, at the Government Hospital for the Insane in Washington, D.C., and was buried in Arlington National Cemetery. He was a Private in Company B who was confined during the battle. William Henry Miller died in San Antonio, Texas, on December 30, 1914, and was buried in the National Cemetery there. He was the Blacksmith for Company E who was with the pack train and in the hilltop fight. George H. Geiger was born in 1843 in Cincinnati, Ohio. He was a Sergeant in Company H who participated in the hilltop fight. He showed extraordinary bravery when, along with Private Charles Windolph, Blacksmith Henry Mechlin, and Saddler Otto Voit, he risked his life to obtain water from the river for the wounded men, an act for which he was awarded the Medal of Honor. He died on January 23, 1904, in Dayton, Ohio, and was buried in the National Cemetery there. Left Hand, an Arikara Scount, was born in the Dakota Territory in 1829 and died on January 23, 1931. He was buried in the Saint Charles Catholic Cemetery in Saint Francis, South Dakota. James Garland Sturgis was born on January 24, 1854, in Albuquerque, New Mexico. He was killed with Custer’s Column and, unlike most officers, was likely buried in the mass grave on Last Stand Hill. James McNamara, who was a Private in Company H and participated in the hilltop fight, died in Pittsfield, Massachusetts, on January 24, 1932. Otto Arndt was born on January 25, 1844, in Bavaria, Germany. He was not present at the battle due to detached service at the Power River Depot. Edward Garlick, who was on furlough during the battle, died in Sturgis, South Dakota, on January 25, 1931, and was buried at the Bear Butte Cemetery there. John H. Meier was born on January 26, 1846, in Hanover, Germany. He was a Private in Company M who was in the valley and hilltop fights, during which he was wounded. Walter O. Taylor, a blacksmith with Company G who participated in the valley and hilltop fights, died in Rockland, Massachusetts, on January 26, 1931. He was buried in the Northville Cemetery in East Bridgewater, Massachusetts. Edward H. Pickard was born on January 27, 1854, in Boston, Massachusetts, and died on January 30, 1928, in Portland, Oregon. He was with the pack train and in the hilltop fight. Jacob Katzenmaier, who was not present during the battle, died in Fort Meade, Dakota Territory, on January 27, 1880, and was buried in the Old Post Cemetery there. Max Hoehn was born in Berlin, Germany, on December 26, 1854. He stayed with the regimental papers at Powder River so he was not in the battle. Timothy Haley was born on December 26, 1846, in Cork, Ireland, and died on December 31, 1913, in Washington, D.C., and was buried there. John Meyers died on December 26, 1877, at Fort Abraham Lincoln in the Dakota Territory and was buried in the Custer National Cemetery in Montana. John J. Fay and John Fox both died in Washington, D.C., on December 26, 1932, and both were buried in the Soldiers’ Home National Cemetery there. Wilson McConnell died on December 27, 1906, in King, Wisconsin, and was buried in the Wisconsin Veterans Memorial Cemetery there. Peter Thompson was born in Markinch, County Fife, Scotland, on December 28, 1843. He died in Hot Springs, South Dakota, on December 3, 1928. David McWilliams died at Fort Meade, South Dakota, on December 28, 1881, and was buried in the National Cemetery there. Richard Winick Corwine who was on detached service during the Battle of the Little Bighorn. George Daniel Wallace who commanded Company G during the Battle of the Little Bighorn and fought in the valley and hilltop fights. Frank Hunter died on December 29, 1899, in Washington, D.C. He was with the pack train and in the hilltop fight during the Battle of the Little Bighorn. William Jackson died at Cutbank Creek on the Blackfeet Reservation in Montana on December 30, 1899. He was in the valley fight. David W. Lewis died on December 30, 1914, at the Government Hospital for the Insane in Washington, D.C., and was buried in Arlington National Cemetery. William Henry Miller died in San Antonio, Texas, on December 30, 1914, and was buried in the National Cemetery there.